Porthole stone found in situ in a wall in a deep sounding to the north of Enclosure B (photo N. Becker, copyright DAI). Deep sounding to the north of Enclosure B, the arrow marks the position of the porthole stone. (Photo: N. Becker, DAI). 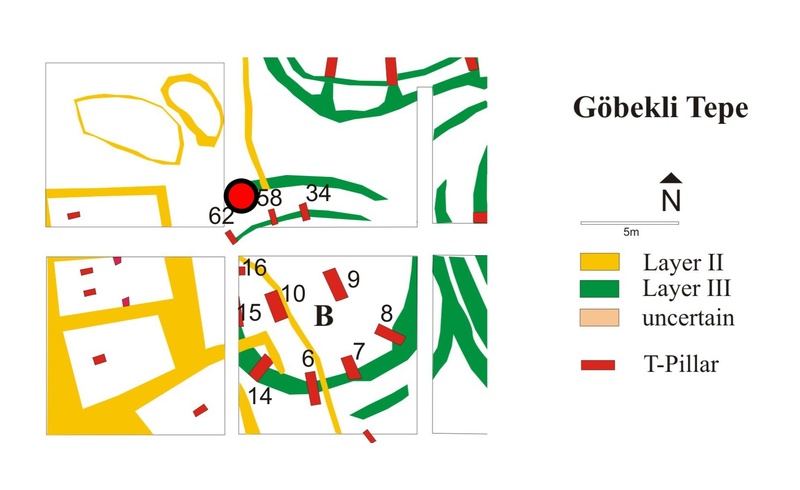 Starting from 2011, work at Göbekli Tepe has focused on the excavation of several deep soundings, meant to contain the struts holding a membrane shelter structure to ensure a durable protection of the site. The soundings, some more than five meters deep, have offered us unparalleled insights into the stratigraphy of the site. The evaluation of this evidence is going on at the moment and will lead to a site formation model soon. But, besides that, many of the soundings, although limited in horizontal extension, have also produced remarkable finds. Among them is the porthole stone presented here. 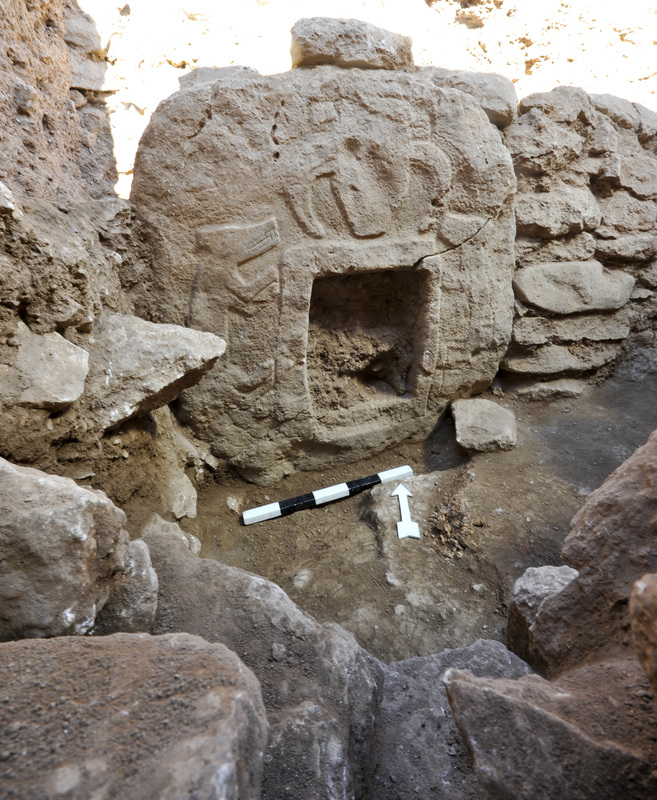 Porthole stone found in situ in a wall in a deep sounding to the north of Enclosure B (Photo: N. Becker, DAI). It was discovered in 2011 in a deep sounding excavated to the north of Enclosure B. Apart from revealing a so far unknown part of this enclosure and two more of its pillars, immediately on the bedrock several walls outside of the enclosure were discovered. In one of them, a decorated porthole stone stood in situ. The subrectangular hole in the middle of the stone is flanked by two antithetic foxes, apparently portrayed in the moment of jumping (at each other, at the entrance, the visitor?). Above the hole, a bucranium was placed. Unfortunately, the sounding could not be enlarged to explore the room enclosed by the wall. It thus remains unclear, whether the porthole stone really marks the entrance to the building, or the animals were ‘guarding’ a niche with important contents within a room. That is amazing. Evidently the bucranium was of utmost significance to the people, and symmetry as well. I have a question, do all the animals that appear on the pillars come from the surrounding area? I have a theory that Gobekli tepe was filled in by the melting of the glaciers which carried the earth and gravel naturally. I have also just noticed the shape of buildings have a familiar look of an bronze age wheelhouse. The buildings could have been used to store grain and this could be the reason for the great amount of grind stones found in the area. I am a woodcarver [patternmaker] and find it very difficult that no metal tools were used in the sculpting process. I think that metal was used in the carving process and why we cannot find any metal tools is because the same way I feel about my tools, do not let anybody touch them and hide them if possible. b. There are artefacts in the filling. Definitely no natural process. And Pleistocene glaciers were restricted to some high areas of Turkey anyway. c. There is no connection to the Bronze Age. We are millennia before that. d. Grinding stones, mortars and pestles have been found in the monumental buildings, but most come from layer II rectangular rooms. It takes more than just the presence of grinding equipment to determine a buildings function though. For example, some of the aforementioned rooms also have large limestone vessels for storage. e. There are definitely no metal tools around during the PPN. Limestone can be carved with flint tools easily. There are very few obsidian tools from GT, flint is the most frequent material used. I doubt that the composition over the rectangle was a decoration. It was significant because it was a message in sign language. It speaks to the ancient water cycle based cosmology. This cosmology was far older than Gobekli Tepe, at least by 40,000 years. The “porthole” was probably a outlet from either an ancient spring, when the climate was more temperate than at present, or a channeling of rain water runoff to reinforce the cosmology. The signs are somewhat eroded but parts of the message can be translated. The generalized message states that this, the “porthole” is an opening to a hidden or unseen-place. and the great one, Venus, climbs up on the eastern and western sides of the earth. This was considered a wonder or a” miracle.” The appearance of Venus, from within the Cave or Womb of the Female-earth is at a holding-place on the surface of the earth (areas of collected water). Nothing at Göbekli Tepe is just ‘decoration’ in the sense of meaningless decor. It is hard to always stick to more neutral terms like imagery, and at least in Prehistoric Archaeology terms like decoration or ‘art’ are generally used without implying any further meaning. I find it hard to see a connection between the two foxes and venus though. 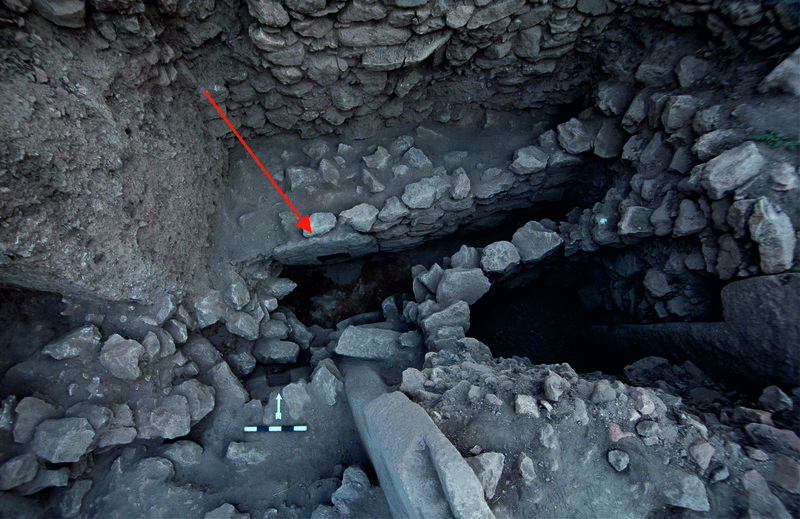 There are no artesian phenomena at Göbekli Tepe. Rain water was collected in cisterns on the limestone plateaus adjacent to the site, but no porthole stones were ever found in such contexts. None of the known porthole stones shows any signs for water running through the openings. You are correct about the link between the Fox and Venus. To keep my comment brief I generalized the overall message of the composition. The link is indirect as the Fox Imagery represents something wondrous, very clever, akin to a miracle in today’s terms. Thus the Fox climbing upwards in the east an west is what creates an indirect connection to Venus. Based on a multitude of ancient compositions it is the Eye (of the Fox or any other animal) that represents Venus. A metaphor was made between the the Eye of the Sun and Venus. Venus appears as a forerunner of the Sun’s appearance in the east thus acting as its “Eye.” Another connection with the Eye as Venus is that the composition over the Rectangle forms a Face. On the Left , in the east, is a Square that means the House, used in the sense of a Lineage. The House, position-ally, alludes to the Eye of the Face thus the House, the Lineage, of Venus. The lack of any signs of a natural water source is problematical and makes one wonder why this particular hill was chosen to represent a water based cosmological center. Perhaps it had something to do with where the cultures main populations were based. The Maya did something similar when they built large “temples” that were shaped in the sign for a mountain. They also had a water cycle based cosmology that originally, focused on revered natural springs. This is the reason for the large Serpents (representing streams of water) running down the sides of the temples. Next to the cistern in Gobekli Tepe are cupules patterned in the shape of water-spirits. These cupules collected rainwater and when the water evaporated it reinforced the idea of the spirits of the deceased warriors and warrior-priests, as water-spirits, ascending to the sky where they merged with Venus. I do wonder if the “portal” stones were actually intended to be positioned vertically. If they were placed flat on the ground water from the cistern could be placed into the “portal” on special occasions. Dual Portals would represent the places of water in the east and west as in gesture signing the left always represented the east regardless of the actual position of the signing person. The actual size of the ‘porthole’ is only indicated by the measuring stick, which I take to be marked off in ten cm bands. That would suggest a 40-50 cm wide hole. Correct? Yes, the scale is measuring 50 cm in total.